How Down syndrome is redefining the abortion debate. After prenatal testing shows a fetus is at risk, families are faced with a profound decision. The national abortion debate is making it even harder on them. Celeste Blau’s first pregnancy was smooth from the beginning. She stayed active and kept working at the gelato shop she owns with her family outside of Cleveland. She wasn’t ignoring the pregnancy, exactly—it was planned—but she didn’t think of herself as a very maternal person, and pregnancy seemed like something to endure rather than to enjoy. At her first ultrasound, she was mostly excited to find out whether she was having a boy or a girl. She was 31, relatively young, and it didn’t occur to her that anything could be wrong. The ultrasound appointment at the Cleveland Clinic took three hours. She only realized that was unusual a few years later, when she was pregnant again and the same process took 30 minutes. Lying on the table, her belly smeared with gel, she started to feel a niggling fear when the technicians weren’t laughing at her and her husband’s jokes. (“And we’re funny!” she said.) Afterward, the doctor asked to speak to them in his office. He was concerned because the baby’s brain ventricles looked enlarged, Blau recalls, and he scheduled her right away for an MRI, a chromosomal blood test, and meetings with a pediatric neurologist and a geneticist. Initially, the results were reassuring. The MRI looked good, and the geneticist saw no cause for concern. To celebrate, Blau and her husband drove to an Italian restaurant nearby for lunch, an old family spot where her grandparents and parents had gathered countless times over the years. They were in the parking lot when the geneticist called back. In fact, she said, there was an issue: The baby was likely to have Down syndrome. Now they just had to decide what to do. Celeste Blau and her husband, Patrick, play with Clementine at a park in Cleveland on May 25. Down syndrome is the most common chromosomal disorder in America, affecting about 1 in 800 births in recent years. People with the syndrome, also known as trisomy 21, have a range of intellectual disabilities, a higher likelihood of heart problems, and physical markers including small stature, upwardly slanted eyelids, and a distinctive crease across the palm of the hand. Prenatal screening for Down syndrome has been available since the 1970s, but until recently, the only methods were invasive procedures like amniocentesis that carry a risk of spontaneous abortion. All this changed with the advent of a simple blood test—the kind Blau took—that became available in the early 2010s. “Cell-free” DNA screenings analyze traces of fetal DNA that circulate in the mother’s own bloodstream. The test is relatively painless and can be performed weeks earlier in the pregnancy than amniocentesis. And these developments in prenatal testing have already had profound consequences for the debate over abortion. In many parts of Europe, including the United Kingdom, the termination rate after a prenatal Down syndrome diagnosis is now more than 90 percent. In Iceland, where testing is widespread, “we have basically eradicated, almost, Down syndrome from our society,” one geneticist told CBS last year. In Denmark, where all pregnant women have been offered screening scans since 2004, the disorder is heading for “extinction.” In Ireland, one of the few Western European countries where it is still commonplace to encounter people with disabilities like Down syndrome, citizens voted overwhelmingly on Friday to reverse the country’s strict constitutional restrictions on abortion. Down syndrome had become a contentious element in the public debate. A billboard from the “Save the 8th” campaign, which favored maintaining restrictions, featured a boy with Down syndrome and the tagline, “Abortion discriminates.” One mother of a 10-year-old with Down syndrome told a reporter that she worries her son’s community is “being wiped off the face of the Earth with abortion.” The stakes of this debate are clear: It’s a conversation not just about prenatal testing but about personhood, about whether Down syndrome should be considered a condition or a disease. Blau remembers her initial fears, which she feels guilty about now: Would they ever travel again? Would the little girl be cute? It feels inevitable that Down syndrome would have become a flashpoint in the national abortion debate. And, given the recent inroads made by anti-abortion activists, most of the legal battles are taking place at the state level. Over the past several years, Republican legislators have introduced a series of state laws that would restrict access to abortion in cases of Down syndrome. North Dakota’s legislation went into effect in 2013, and the Pennsylvania House passed a bill in April. Legislators in Illinois, Kentucky, and Utah have debated similar bills this year. In January, a Utah state representative called her bill “Utah’s message to the world that we will not tolerate discrimination.” In Ohio, where Blau lives, governor and 2020 presidential hopeful John Kasich signed a law in December that would criminalize the procedure in cases where the doctor knows that the patient believes the fetus has Down syndrome. Ohio’s law would make it a felony for a doctor to perform an abortion if he has reason to believe that the woman is seeking the procedure “in whole or in part” because the woman believes the fetus has Down syndrome. It “would be the most extreme abortion ban in the country,” said Gabriel Mann, communications manager for NARAL Pro-Choice Ohio, “because it could be applied in every single case just based on the thoughts of the patient.” Theoretically, he said, a patient could be issued a subpoena to testify in court about her reasons for seeking the procedure. In Blau’s case, such legislation would have made it essentially impossible to get an abortion after getting the results from the geneticist—simply because of what she now knew. Clementine holds onto her mom at a park in Cleveland on May 25. From the perspective of the Down syndrome community, a diagnosis should be the start, not the end, of a family’s understanding of what life is like with trisomy 21—whether termination is being considered or not. The community is diverse, with the usual spectrum of political and religious views on abortion. Many Down syndrome parent groups have gone out of their way to avoid taking a stance on anti-abortion legislation like Ohio’s because the bills are so divisive. Other parents are alarmed at the prospect of not being able to decide the fate of a pregnancy for themselves. It’s understandable that a parent of a child with Down syndrome might feel that the opportunity to abort makes it more likely that people would miss out on an experience they have found deeply rewarding. It’s also easy to be firmly pro-choice, and also unsettled by the termination numbers and the language of eradication. And then there are parents who didn’t receive a Down syndrome diagnosis until their children were born and must quietly grapple with the question of what they would have done had they known earlier. Blau’s screening came relatively late, around 20 weeks. She hardly received any concrete information from the hospital about Down syndrome, she recalls. But she read a guidebook about parenting a baby with the disorder, and that helped. A teenage family friend had Down syndrome, so she was vaguely aware of what her daughter might be capable of. It surprised her husband, who she says never wanted to consider abortion, to find out that their daughter would likely be able to read, for example. (“I don’t know that they’re reading the Iliad or Anna Karenina, but I’m not either,” she said.) The hospital assigned the couple a support person to help them navigate the system, and she gave them a printout of a short inspirational essay written in 1987 by the mother of a child with Down syndrome. The popular essay compares preparing for a baby to preparing for a trip to Italy. After months of anticipation, you land, and the flight attendant announces: “Welcome to Holland.” It’s not worse, the essay concludes. It’s just different. 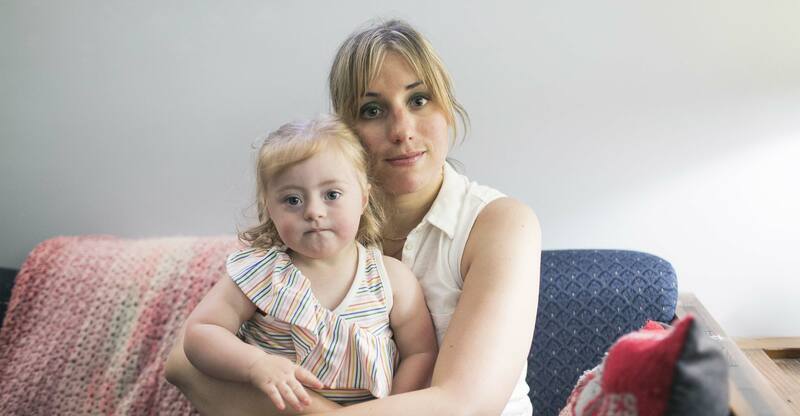 For many people in the Down syndrome community, the problem is not that abortion is available. Rather, it’s that prospective parents are given such paltry, dour, and often inaccurate information at the point of diagnosis, whether that happens prenatally or at birth—information that should be available to anyone regardless of their abortion views. “We’ve found that families who have a really traumatic diagnosis experience, it takes them longer to come to a place of acceptance,” said Heather Bradley, the president of the board of the Down Syndrome Diagnosis Network, a nonprofit that provides support and information to parents. She counseled one family in 2011 who received an informational booklet from the 1980s using the outdated slur mongoloid, and another shaken recently when a nurse attending the birth cried and said, “Your baby has ‘the Down’s,’ ” also an outdated and offensive term. Even in the best of circumstances, the conversation is a high-wire act for doctors, especially with early tests that indicate a likelihood but no certainty. “Calling someone is really complicated because I don’t have a diagnosis, I have a tiny grenade in my hand and we have to decide what do next,” said Chavi Eve Karkowsky, a maternal-fetal medicine specialist (and occasional Slate contributor). As the diagnosis unfolds, the doctor may have to address complex medical prognoses, cultural values, family dynamics, further testing, and sometimes even the mathematics of probability with a woman who may still be in shock or denial. Early blood tests are nondiagnostic and reveal only a fetus’s probability of various disorders; the results can be confusing for almost anyone. “It becomes hard to give people useful information,” Karkowsky said. “It often becomes a conversation about, ‘How worried should I be? What would you do?’ ” The doctor must also make clear that decisions about termination must happen within a specific, often narrow, window of time in order to be legal—and attempt to do so without pressuring the woman into choosing that course. Some disability activists have promoted another kind of legislation that could affect women’s decisions in the wake of a prenatal diagnosis: “Pro-information” laws require doctors and genetic counselors to provide what advocates call a more “balanced” portrait of the disability at the point of diagnosis. Some pro-information advocates believe that if they could just give prospective parents a true picture of life with a Down syndrome child, more women would choose to go forward with their pregnancies. In many ways, they argue, there has never been a better time in history to have Down syndrome, or to have a child with the condition. The life expectancy of a baby born with Down syndrome is almost 60 today, compared with 12 in 1949, and children are regularly incorporated into mainstream classrooms. Cultural visibility is now high, too, between the 2018 Gerber baby, the A&E reality show Born This Way, and American Idol. Since 2012, about 20 states have passed laws that require or encourage medical providers to supply patients with approved fact sheets and contact information for local support services. The legislation has historically garnered unified support from pro-life, pro-choice, and disability-rights groups. But the rise of anti-abortion bills like Ohio’s has slowed the progress of the pro-information movement over the past few years. Pro-information federal legislation passed in 2008, but many advocates have found that law disappointingly toothless, since it provided no funding for new materials. And the new state laws have splintered the fragile alliance between the disability-rights and pro-life communities, as the latter have focused their energy on prohibition rather than persuasion. Clementine sits with her mom at their home in Cleveland on May 25. Celeste Blau gave birth to her daughter, Clementine, on May 22, 2016. The end of the pregnancy was as smooth as the beginning, though Blau couldn’t wait for it to end: “Let’s meet her and get started on this,” she recalls thinking. Clementine is a little behind her peers developmentally, but she has none of the major health problems often associated with Down syndrome, and at 2 years of age, she seems to be on the verge of walking. Blau’s mother retired when Blau was pregnant, and these days she watches the toddler and her infant brother, Finneas, at the gelato shop where Blau works. Blau also has support from a center for Down syndrome families that recently opened near her home and a tightknit online group she met through the Down Syndrome Diagnosis Network. Blau believes abortion is a personal choice. But she says she wants to “puke” when she thinks about how abortion crossed her mind after the diagnosis. She knows mothers who admit they would have terminated if they had received a diagnosis in time, and now they say they’re glad they didn’t. She thought about getting tested with her second pregnancy just out of curiosity, but when she found out it wasn’t covered by her insurance, she moved on. Correction, May 31, 2018: Due to a production error, a photo caption misidentified Celeste Blau’s son, Finneas, as Noah.